Bernie Sanders was not presidential [sadly to say – despite many of his ideals being great – if not the best compared to his counterparts]. That is something the American people are struggling to grasp – especially the youth. Donald Trump – is not presidential. But for reasons different than Bernie. Bernie is, well, simply put, without any character, really. Despite all the slogans and witty catch phrases, Bernie is just another product of social trends. He isn’t Justin Trudeau. He isn’t Obama. He just doesn’t have any flair. Americans like intellect – but they equally value humor; athleticism; suaveness – or “swagger” in today’s terminology. None of these are characteristic of Sanders. The same could be said of Donald Trump but for different reasons. He is too uneducated, vulgar, impolite, erratic & irresponsible for such leadership – if not to hold any post. He can barely manage his own funds – or his father’s, rather. That isn’t to say that Hillary Clinton is ‘presidential’. Back in ’08, I hadn’t heard of a guy named Barack Obama, but as the campaign progressed, I realized – I had just witnessed the rise of an extraordinary individual. This man is beyond brilliant – something that few people truly appreciate. I can say that the world appreciates Obama more than America – which is quite telling. That isn’t necessarily true – a lot of Americans love our current president. But the ‘other side’ is equally if not more bent on voicing their hatred – to put it ‘mildly’. Ahead of tonight’s momentous occasion, the first live debate between Clinton & Trump – I share the following sentiment. People often expect too much. This is a sign of…a lack of experience maybe. But other forces play a role too. The world is suffering and yet, the average American struggles to understand the nooks and crannies of his or her own political system and culture. As an Armenian-Syrian immigrant living in America – I must say that my perspective should be heeded. There are many causes which are directly connected to me that have yet to be addressed or have been horribly managed, by the US wholly but also precisely by US president Barack Obama, whom I continue to support. Why? Because I am not a perfectionist in the political sense – and expect some compromise – not always – but in times of necessity and urgency. There is much change, and much work to be done in the stride towards justice – but it is just that – a stride – a path. We cannot be held back by radical expectations which in themselves seek to paralyze our sense of progress. That being said it is clear to me there is only one candidate worthy of a vote in this election and that reasoning is from contrived a moral and practical logic – that candidate is Hillary Clinton. So while she isn’t necessarily the perfect candidate – relative to America’s choices – she is definitely presidential. The US president is a person of immense wisdom and discipline; responsibility and sacrifice; public service and family value. Which of the two candidates possesses these qualities? And if you have to think twice – think again. What gets me is that Americans want to change parts of their system that are less relevant to domestic and global wellbeing while ignoring the more pressing issues. And then when a tragedy or crisis occurs, Americans are left wondering how or why. Instead of a Wall Street revolution there should be a minority rights and immigration reform revolution. Instead of a focus on spreading democracy abroad we should be seeking to reduce our arbitrary and partial political influence overseas. Issues like these are costing us – but instead Americans wish to focus on ideological ambiguities and polarized politics. That is why the candidates have dwindled down to the current options available – one representing the so-called establishment while the other represents the ugliest part of the establishment disguised as anti-establishment. It is undoubtable that America and the world must implement comprehensive political reform – but this is likely an impossible feat under the auspices of a hypothetical President Trump. On the contrary, Hillary, like Obama (but perhaps to a lesser degree since she is more hawkish) – will pave the road for future generations to at least further the cause of progressivism in its purest form. Perhaps future generations will reflect a more balanced perspective on US politics – representing minorities; women; LGBTQ; etc. But this cannot be associated with any particular ideological strand or populist trend as it has been in this election. American individualism and personal responsibility, contrary to the ‘8th grader youtube conspiracy video viewer mentality’ – is not preserved or protected by the far left or right – but rather, by a careful, tolerant moderate centrist. So when I say that Hillary Clinton is in fact presidential – that is precisely why. She isn’t just the echo of our grievances – but also of our reason. Of which direction the wind blew? Pretty sure more democrats have lived pay-check to pay-check than Republicans. On immigration, Rubio cannot backpedal. His family came here illegally. His father worked illegally. Speaking in vague nationalistic sensationalist terminology is a strategy, not a victory. Pointing out realities without solutions is worthless. What does Marco Rubio know about American complicity in propping up non-democratic leaders in the world? What does Marco Rubio know about the association between illegal immigration to America and America’s tacit support for the tyrannical regimes that have pushed their citizenry to abandon their homeland? Rubio sounds like he’s been programmed by the “privileged white mentality” which is beyond paranoid about losing their “exceptional” status in the world, instead of having to actually work for it and compete fairly. The irony. America touts freedom, but it depends largely on the subjugation of the freedom of other nations. GOP is just a bunch of meatheads trying to prove who is more popular and who sounds tougher. Who can lie to the American people better? Who can convince the American people to abandon their selfhood for the sake of blind nationalism? For the sake of what, security? When “patriotic” Americans vilify others countries and their leaders, like for example, Saddam ‪‎Hussein‬, you forget one thing. 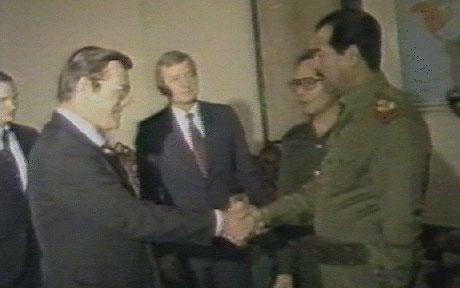 When ‪Saddam‬ dropped mustard gas on the Kurds; when he murdered his own people and sent their bodies cut up in boxes to Middle Eastern families; remember this picture?